Thus Mr. al-Rabiah. 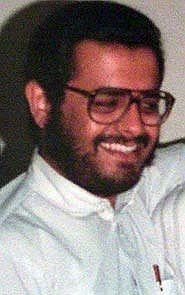 It isn’t just that he was an innocent man thrown into Gitmo, or that he was held even after a CIA analyst concluded that he was innocent, or that National Security Council Staffers were aware of his innocence and actively trying to bring about a review of his detention — Mr. al-Rabiah’s case is apt because after the CIA’s 2002 determination of his innocence, he spent another seven years wrongly imprisoned, regaining his freedom and seeing his children only after retaining the help of American attorneys. Ms. Cheney, Mr. Kristol, Mr. Thiessen and Mr. McCarthy assert that American lawyers who represent Guantanamo Bay detainees are helping the enemy in a time of war. Here is a case, however, where the Guantanamo Bay detainee was innocent, languished for years in custody without a lawyer despite official knowledge of his innocence, and ultimately achieved his freedom with legal help. Ms. Cheney, Mr. Kristol, Mr. Thiessen and Mr. McCarthy have no answer for people like Mr. al Rabiah and his attorneys — their poorly reasoned McCarthyite rhetoric is bankrupt because they are unable or unwilling to acknowledge the distinction between being accused of being an enemy of America in war time, and actually being an enemy of America. The Andy McCarthys of the world endlessly lecture us about how this war is different because it’s fought on one side by non-uniformed terrorists. And there’s some truth to that. It is different. But one of the ways it’s different is that it’s not always simple to know who’s a real enemy combatant and who’s not. And if that decision is left entirely up to the executive branch, you’re practically begging for the same kinds of abuses that you get if you let the executive branch operate without oversight in any other area. Thus, lawyers and judges have a role to play. They aren’t aiding the enemy during wartime, they’re trying to figure out who the enemy really is. Even Andy McCarthy ought to be interested in that.